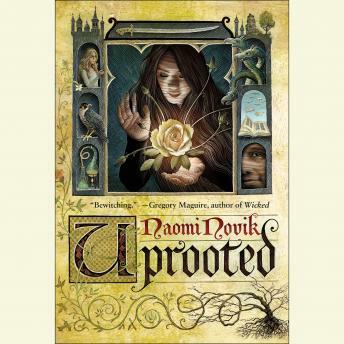 “Uprooted has leapt forward to claim the title of Best Book I’ve Read Yet This Year. . . . Moving, heartbreaking, and thoroughly satisfying, Uprooted is the fantasy novel I feel I’ve been waiting a lifetime for. Clear your schedule before picking it up, because you won’t want to put it down.”—NPR|Tordotcom|WINNER OF THE NEBULA AWARD FOR BEST NOVEL • Naomi Novik, author of the New York Times bestselling and critically acclaimed Temeraire novels, introduces a bold new world rooted in folk stories and legends, as elemental as a Grimm fairy tale. Excellent enemy. No silly monsters or instantaneous magic. The personalities and use of spells made for an ambiance of reality even while the setting was fantasy. Yes, the narrator’s accent might have gotten in the way sometimes but I felt it was right for the story and environment. . Loved it!!! I like the friendship that firms and the protagonist is such a joy to follow. What's to say? It's the perfect balance of real life struggles and magic. The narrator did a fantastic job bringing the main character to life. It was just wonderful. Loved the book, but the narrator's voice/accent is sometimes grating. Still, made for a great read. Book would have been great with another narrator, I stopped four hours in because I could not bare the accent any longer. Definitely loved! Creative and new. Satisfied the craving for fantasy, romance, and adventure.